1. Last year, I watched a documentary called I Am Comic which featured comedians talking about the challenges and joys of performing comedy. I love watching stand up so I watch almost anything involving behind the scenes stuff about comedy. It was really interesting to see just how demanding and relentless it is to perform comedy. The kind of drive a comedian needs to succeed is intense. They are relentless in marketing themselves and completely shameless about it and I found that combination inspiring. Writers could benefit from that energy. I tend to believe writers have to be the most vigorous advocates for themselves. If you won’t fight for your writing, who will? Closed mouths don’t get fed. I love that saying because it is so true. If you want an opportunity, ask for it. A lot of people believe there’s some kind of magical formula for certain writing and award opportunities but most of the time, it is writers who have chosen to advocate for themselves who benefit from these opportunities. Every day, I hear a writer lament about how uncomfortable they are with sharing something as innocuous as a link to their work. Relax. Share the damn link. If you write and submit your work to a magazine and consent to have that work published, you want to be read. Accept that you want to be read. Make peace with yourself. There is no shame in it. There is a difference between self-promotion and being obnoxious. In the time you Tweeted about feeling bad about sharing a link you could totally just share the link. 2. John Scalzi has provided handy links to the Hugo short story nominees. Expand those reading horizons! 3. Electric Literature is doing a Kickstarter for their Recommended Reading project. You might also become a member of the Los Angeles Review of Books which consistently produces excellent literary commentary. 4. Here are some great free e-books. 5.What the hell is going on with this season of Survivor? They assembled the stupidest cast in the history of reality television casts, and that is quite a feat. Each episode I am struck by how everything continues to go awry for everyone. It’s baffling. 6. Anna Leigh Clark compiled a great annotated guide to the journalism and arts & letters Pulitzers. 7. I’ve been thinking about James Salter as I continue to familiarize myself with his work and I am particularly impressed by his descriptive power, both in A Sport and a Pastime, and Last Night. I was also thinking about this whole men’s versus women’s fiction business and how writing really cannot be measured by gender. There are more similarities than differences between these two passages (a rich sense of place, the implication of more story than is being told, clean prose), which makes the fact that we spend so much time talking about women’s fiction and the like, a bit perplexing. 8. What has always impressed me about soap operas is how the genre has mastered serial storytelling. We applaud primetime television shows for staying on the air for 100 episodes when there are soap operas who have celebrated 10,000 episodes on the air. Year after year, they tell the same stories about the same characters but they do so in a way that keeps people watching. Or they did. Over the past few years, soap operas have been dying, fairly quietly. As the World Turns was cancelled. Guiding Light was cancelled. All My Children and One Life to Live are now cancelled. Thankfully, my beloved General Hospital remains unscathed but as any soap fan now knows, it is only a matter of time before the remaining soap operas disappear and daytime television becomes littered with unscripted lifestyle programming. As I’ve continued to think about writing novels and teaching the writing of novels, I have been oddly inspired by soap operas and what they do (and don’t do) well in long form storytelling. 9. The Guardian has a wonderful interview with Toni Morrison. 10. Google Art Project has added new works (via Missouri Review). 11. Anne Helen Petersen decoded Beyoncé’s new Tumblr and her analysis is exceptional. 12. Eastbound and Down is over. What a show. 13. Joel Stein wants adults to read adult books. 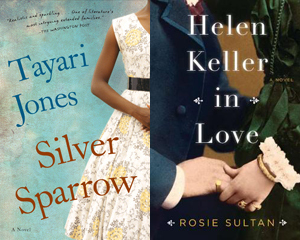 Two new books are out now or soon–the paperback version of Silver Sparrow by Tayari Jones, which I reviewed last March, and Helen Keller In Love by Rosie Sultan. I have a copy of each to give away. I’ll do a random commenter drawing on Friday, so if you want one of these books, comment between now and Friday and say which book you would like to read.